Although the 4th generation Corvette was a revelation when it was launched in 1984, by 1996 it had been developed and improved as much as it could. After 13 model years a successor was long overdue. 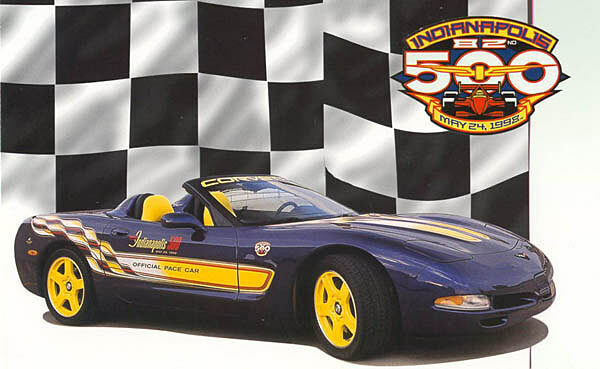 Into a world full of anticipation, the current Corvette, generally referred to as the C5 (5th generation of Corvette), was unveiled, and was as ground-breaking in 1997 as its predecessor was back in '84. When the C5 was unveiled it received as much attention as Pamela Anderson coming out of the sea on a hot day: road testers went wild about the 175 mph top speed, sub-5.0 second 0-60, low 13 second quarter mile times and lavish equipment levels. Lucky owners and magazine staff alike agreed that this 'Vette is indeed the best yet. Even a certain British mainstream motoring magazine admitted that, although they had some reservations at first (mainly about the car's appearance), after a long term test they admired the C5's surprising practicality and accessibility of it's performance, ruffling the feathers of a few prancing-horse fans in the process! C5 Corvette introduced, initially in 4 speed automatic form only with a 345 bhp all aluminium engine designated the LS-1. The car is completely re-engineered and bears no resemblance physically or visually to its 4th generation predecessor. Available as a coupe only in 1997. The one-piece targa top is removable by means 3 quick-release levers - a significant improvement over its predecessor which had a bolted-on roof. Transmissions are now relocated at the rear in transaxle configuration. The 6-speed (Borg Warner rather than the original ZF used on the C4) manual option is offerred later in the year. Car introduction delayed with 9752 units produced in 1997. 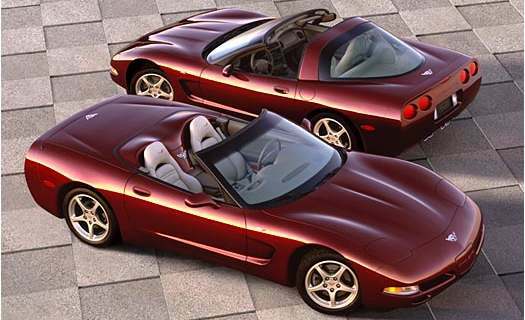 The C5 is available as a convertible for the first time in the 5th generation Corvette. The roof operation is manual but can be accomplished easily and quickly. A very rare and desirable Pace Car edition of the convertible body style is offerred with a distinctive colour scheme that is hard to miss! (click picture). The first full year of C5 production sees 31,084 cars produced. The "fighter-plane inspired" Head Up Display (HUD) option is offerred, projecting speedometer and tachometer readings onto the windscreen, helping the driver to be more focused on the road when driving hard! Hardtop fixed-roof body style available on a Corvette for the first time since 1967. Features new 375 bhp LS-6 high output engine. 2000 New design fine spoke wheels available in choice of standard or highly polished finishes. "Millenium Yellow" exterior colour introduced. 2001 Z06 Corvette available combining the Hardtop body style with more performance and lighter weight to give a purer performance car. Available with 6-speed manual only and a restricted range of standard\ features and options. More on the Z06 here. Standard base coupe power increased to 350 bhp. All Corvettes are now fitted with an aluminium exhaust. 2002 Hardtop power output is increased to 405 bhp and torque output to 400 lbs/ft. Several improvements made to Z06 including revised shock valving, new front brake pads and standard fitting of HUD (previously an option). More on the Z06 here. The 50th Anniversary special edition Corvette is released. Available as a coupe or convertible it celebrates 50 years of America's sports car and is the longest running sports car model name in history. The Anniversary special edition is only offerred in the new colour of "Anniversary Red" and features 2-tone leather interior trim, anniversary badges and Magnetic Ride Control as standard. Corvette 0-60 is quoted by Chevrolet at 4.4 seconds -standard 6-speed coupe / 3.9 seconds - Z06 coupe!